TWO shots that hit the upright, two monumental blunders by out of sorts referee Thabani Bamala, were the two key talking points in yesterday's Castle Lager Premier Soccer League encounter watched by a near capacity crowd at Barbourfields Stadium. Highlanders captain of the day Prince Dube announced his presence in his first official match at Barbourfields since returning from South Africa with a 13th minute flashing move when he was sent through by Devine Mindirira. However, his booming volley on the run struck the upright post with Caps goalkeeper Prosper Chigumba well beaten. Dube was to curse his gods again in the 30th minute when another attempt to score saw the upright again in the way. Highlanders continued dominating possession but they failed to turn it into goals. "I thought Highlanders were in total control of the first half," Caps United coach Lloyd Chitembwe said in his post match interview. When the second half got underway, The Green Machine was a changed side and took the game to Bosso. 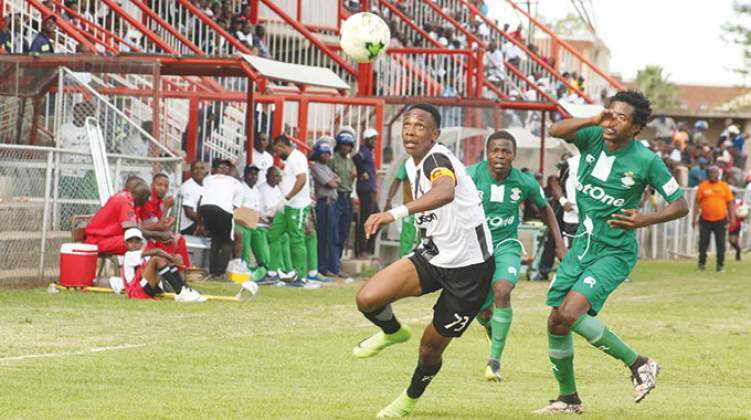 It was in one such raid that the first of the referee's blunders came when he waved play on after the lanky Valentine Ndaba was pushed off the ball by Bosso central defender Peter Muduhwa just inside the box. Deep into the second half, Bamala then infuriated the Highlanders technical bench when he chose to resume play with a drop ball instead of a Bosso free kick after Mindirira was brought down in the centre. Another big moment of the game was two minutes before time when Caps' Dominic Chungwa thought he had given his side the winner after reacting faster to an Ariel Sibanda spill, but far side assistant referee Wirimai Muroiwa had long raised his flag for offside. Despite going for 180 minutes without a win, Highlanders' coach Madinda Ndlovu was not pressing any panic buttons, arguing that it is still early. "It's still early stages of the season and besides this was not an ordinary game. It was a classic encounter and we witnessed one of the most exciting games. We are satisfied with the performance and the outcome," said Ndlovu. Chitembwe, while generally satisfied with the final outcome, was a bit disappointed with their failure to turn their second half dominance into goals and the disallowed 'goal'. "We are told by the same referees that if a push happens, its a direct kick and if it's inside the box, a direct kick is a penalty, but on that case it never happened," said Chitembwe.